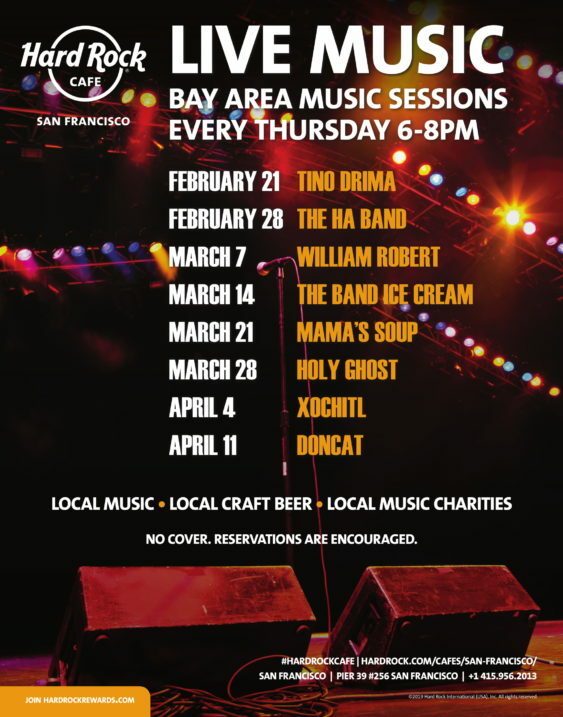 Starting 2/21/19 each Thursday from 6-8 PM Hard Rock Cafe will be featuring a local band, craft brewery, & donating part of sales to a local Bay Area music nonprofit. 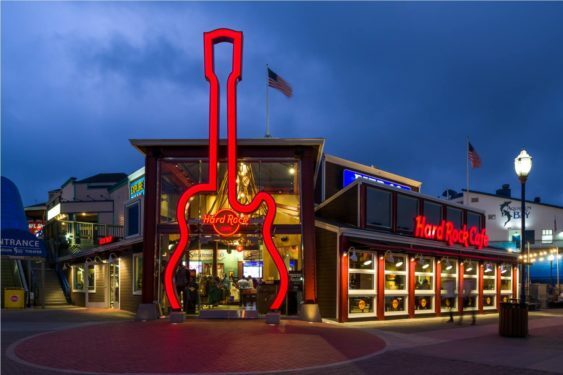 It’s Hard Rock’s Bay Area Music Series. Free Entry l Reservations for dining are encouraged. Food/Drink for purchase. Tino Drima is a cauldron of then, now, and what will be. Crooning hell harmonies over charmed, ripping beats Tino channels music that feels like it has always existed. Think the inter-dimensional 50s radio in Old Man Cooper’s house that portals Classics from a more excellent world into his living room and everybody wants to hang out and listen and maybe stay the night even though it’s weird there. Anchor Brewing will be in the house serving their Fog Breaker IPA and Brewers Pale Ale! The HA is a San Francisco based band that plays Beach Funk Americana; music that celebrates the human condition and the gathering of friends. Music to party to. Drakes Brewing Co will be in the house serving their Flyaway Pilsner and Hefeweizen! After a career in professional football, William set out to re-invent himself as a socially conscious musician and entrepreneur. William knows that music can heal & can bring the most unlikely people together; music makes strangers friends. Eclectic in his musical tastes, it’s hard to categorize his sound into one genre (Indy-R&B/Soul-Pop) but in every song there is a raw energy and soulful passion. His music lifts listeners out of the grey. The nuanced yet singable melodies demand to be heard, but above all else, they make you smile. Calicraft Brewing will be in the house serving their Coast Kolsch and Oaktown Brown! Dairy Rock/Melting Pop. Give me ice cream, or give me death. The Band Ice Cream from San Francisco, CA plays relatable garage rock songs. 21st Amendment Brewing will be in the house serving their Blood Orange IPA and Watermelon Wheat! Mar 21- Mama’s Soup Band with Anchor Brewing Co. This Bay Area Five Piece is brewed with Funk, R&B, Jazz and Soul. Mama’s Soup features velvety vocals backed by silky smooth bass, ambient synthesizer, melodic guitar and a crispy tight backbeat. They draw for musical inspirations like Snarky Puppy, Anderson Paak, Flying Lotus, Jill Scott and Hiatus Kaiyote. From love songs to hard-hitting protest anthems, their live shows will satisfy any musical diet. Anchor Brewing will be in the house serving their Fog Breaker IPA and Brewers Pale Ale! Mar 28- Holy Ghost with Drake’s Brewing Co.
Holy Ghost features Andrew St James and Cody Rhodes member of Christopher Owen’s Curls, touring member of Geographer, and most recently sat in on percussion with Metallica’s for their All Within My Hands Foundation show. Drakes Brewing Co will be in the house serving their Flyaway Pilsner and Hefeweizen! A songwriter at her core, Xochitl writes a variety of genres from jazz, childrens, rock, pop, electronic, and country. All music is available on Spotify, iTunes & Apple. Her ability to switch and write for all genres, her passion to inspire others, and connect with an all age audience. Not only is Coyote Creates an artist, Coyote Creates is a brand within herself. She represents her love for art, music, activism, the environment, and youth. Calicraft Brewing will be in the house serving their Coast Kolsch and Oaktown Brown! DONCAT is Duncan Nielsen, a San Francisco based songwriter and performer with a penchant for rock, soul and folk stylings. His songs draw from the deep history of California counter-culture music and discuss both the hope and uncertainty of the American dream in kaleidoscopic cynicism. New release ‘Preservation of The Spirit’ is a brief 8 tracks, but delivers concise themes of artifice, modern myth, disintegrating social fabric, and, as the title namely outlines, preserving ones spirit when it’s time to, well, face the music. Each song is a distinctly American narrative rife with poignant satire. In ‘Once I Went to Las Vegas’ Nielsen sings, “I’m smoking cigars in a cheap suit/eating foie gras in a restaurant, five stars/are these my lucky cards?” The album shifts casually between swirling, hypnotizing textures and reckless, loud, electric-guitar bravado – a tasteful blend and welcome progression from his earlier, folkier leanings. 21st Amendment Brewing will be in the house serving their Blood Orange IPA and Watermelon Wheat.